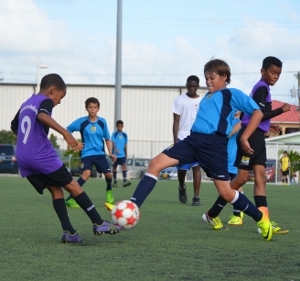 (CUC-PFL): The always entertaining 2013/2014 CUC Primary Football league (PFL) concluded this past Saturday, January 25, with Cayman Prep and Red Bay Primary emerging as the season’s clear winners with two titles a piece. Cayman Prep won their first of two titles in the Under 9 Champions Cup final as they defeated previously unbeaten Savannah Primary 1-0 thanks to a 38th minute strike from midfielder Tom Byrne. Savannah Primary’s impressive run to the final included a 1-0 victory over Cayman Prep in the third round of the PFL Playoffs but this would not be the Under 9 defending champions’ day. The boys from Savannah had not conceded a goal during the regular season or the Playoffs and had scored15 goals during the four playoff days. Cayman Prep’s victory was revenge for last year’s 3-2 loss to this same Savannah Primary team in the Under 9 Champions Cup final. Last year, Cayman Prep had reached the final going undefeated only to falter at the last hurdle. The Gerome Graham Award for Most Valuable Player in the Under 9 Champions Cup final went to Cayman Prep’s defender Jacob McMillan-Cullen, who had an outstanding game. St. Ignatius Prep’s Jace Jervis and goalkeeper Jayden Miller emerged as the heroes from this thrilling Under 9 Champions Cup third-placed matchup between St. Ignatius Prep and Sir John A. Cumber Primary. Following a goalless 50 minutes and 10 minutes of extra time, it would be penalties that would ultimately settle this Group A rivalry. It did not begin well for St. Ignatius Prep as Alex Novak drove his penalty straight at the Sir John A. Cumber goalkeeper, but Matthew Lloyd-Hickey and Chad Owen netted the next two to keep St. Ignatius’ hopes alive. Sir John A. Cumber’s Owen Gordon and Rashaad Powery scored the first two penalties for the West Bay outfit butLewis Clarke failed to find the target and after three penalties, the score was locked at 2-2. On to sudden death penalties and the pressure was on. St. Ignatius’ Jace Jarvis stepped up and slotted home his attempt but Sir John A. Cumber’s Shaunjay Bodden could only find the knees of St.Ignatius’ goalkeeper Jayden Miller, which ultimately secured the 3-2 win for the Catholic boys. In the Under 9 Consolation Cup final, Red Bay Primary won their first of two titles as they held on to defeat defending Under 9 Consolation Cup champions Bodden Town Primary 3-2. Red Bay’s prolific goal scorer Alejandro Holness scored twice in the 14th and 15th minutes and Tyru Nixon added a third in the 26th minute to put the youngsters from Red Bay on course for the win. Bodden Town’s captain Jacobi Tugman pulled one back for his team mates in the 32nd minute and rattled the Red Bay coaching staff’s nerves scoring his second in the 50th minute. At 3-2, it was ‘game on’ but Bodden Town Primary was unable to find the equaliser in the final 10 minutes. Red Bay was champions. Defending Under 11 Champions Cayman Prep stamped their name in the PFL history books with a 2-0 victory over St. Ignatius Prep thanks to two wonderful goals from Aaron Jarvis in the 15th and 24th minutes. For his two goal contribution, Aaron Jarvis was awarded the Justin Henry Memorial Award as Most Valuable Player in the final. This victory was Cayman Prep’s second title for the day and the third for the season after winning the 2013/2014 Opening Rally championship in September. Cayman Prep’s second successive undefeated season (regular season and playoffs), which may not ever be equalled.Cayman Prep’s only blemish was a loss to Sir John A. Cumber Primary in the final of the 2012/2013 Opening Rally last October. nd minute. Sir John A. Cumber’s inability to consistently find the back of the net has plagued their 2013/2014 campaign and it was no different for this their final game of the season. South Sound Schools were their usual busy selves making it difficult for the boys in red from West Bay. Kiran Connolly-Basdeo put in another solid performance in the South Sound rearguard (Note: Kiran Connolly-Basdeo was mistakenly named as the scorer of the own goal during last week’s semi final game with Cayman Prep). before the half time break. Red Bay’s Tekwan Truman sealed the victory for Red Bay with one of the ‘goals of the day’ as he volleyed home a cross just past the outstretched arms of goalkeeper Satiah Miller. Following the games, trophies and medals were presented to the respective schools by CUC’s President and CEO Richard Hew. As always, special thanks to all the officials Ronnie Roach, Dwayne Ebanks, Shakur Welcome, Chastine Rankine, Shannelle Frederick, Collin Redden, Thompson Hew, Ernie Jacques, Ryan Burke, Sylvester Coleman and Joshua Frederick for their assistance throughout the season, and to sponsors Progressive Distributors, sole distributors of Gatorade to all the schools for the past nine years. Thanks to all the coaches, parents and supporters who make the CUC PFL “the most powerful game” to watch. The 2014/2015 CUC PFL season commences in only eight short months.